Engage in conversations and discussions, using active listening behaviours, showing interest, and contributing ideas, information and questions. Do you have a friend who lives close to you? What do you like to do with your friend/s? How do you get in touch with your friend? Do you have a special way of greeting/talking to each other? Tell students that Amy and Louis have a special way of calling for each other and ask them to listen for this. Also, have them listen for things that Amy and Louis do together to see if any match what they like to do. Do you have any special words you use in your family or with friends? Do you have different ways of saying ‘Hello’? Have you ever moved away? Have you ever had a friend or someone in your family move away? As a whole class collect special words and different ways of greeting/calling each other. Discuss when and why we use different ways to communicate. Explain to students the origin of the term ‘cooee’. Class could use this during outdoor activities and greet each other using a different language or system such as signing each day. Ask students to stand in one part of the room if they had a friend/family member move away and in another part if they moved away. Whether they still communicate with friends/family and if so, how? Ask students who are in neither group to imagine how they would feel and how they could still communicate. As a whole class, have groups share. Record key feeling words. Ask students to notice if the feelings of different groups are similar or different. Model/jointly construct making a short video-clip, on an I-pad or other device, to show the special way that Amy and Louis called each other and explaining the origins and uses of this special call. In groups of three, have students make short video-clips showing a special way of greeting/calling someone and briefly explaining when and why it is used. What makes someone a special friend? Why do you think Amy and Louis are such special friends? As a whole class share group responses. Record key ideas words/phrases. These could be used to create a ‘friendship’ word wall. sitting the same way, but like opposites, like in a mirror. are like a reflection of each other. Continue modelling/jointly deconstructing the book, recording clues in a table (PDF, 124KB). Note: depending on students’ familiarity with this process and their knowledge about language and images, you may want to look at language and images separately. Stop at the point where Amy moves away and ask students in small groups to examine the two double pages, seeing what differences they can find in how these two pages are drawn compared to the first part of the story. Model a Venn Diagram (PDF, 95KB) to show what was similar and what was different for Amy and Louis when Amy moved away. Have several students take the ‘hot seat’ as Amy and Louis and ask them how they felt about being separated etc. Then have them complete Venn Diagrams (PDF, 294KB) comparing the events, experiences and feelings of the characters Amy and Louis to those of their friend/s and theirs. Students then video each other and orally share their response to the book, drawing on the information in the Venn Diagrams to support their connections and preferences. In pairs, have students locate where they think the complication begins (when Amy moved away) and where they think the resolution begins (when Louis called out to Amy). Confirm these two points as a whole class. Building on the work done in the last section, model finding and recording clues in words and illustrations (in the orientation stage) that show how things usually were. In pairs, have half the class examine the page where the complication begins and the other half, the page where the resolution begins. Ask students to find clues in the words and illustrations that show a new stage of the story is beginning. Join each complication pair with a resolution pair, and have them share their findings. As whole class discuss findings, recording clues. Below is a suggested table format for recording these findings. 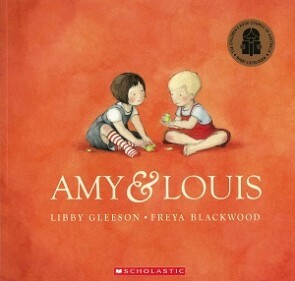 Explain that the author uses words that give extra details (circumstances), telling us where Amy and Louis are and that this is important to show us about their friendship and how it changes when Amy moves. For the orientation stage of story only, have half the class look for details about Amy and the other half look for details about Louis, completing relevant tables showing where (PDF, 135KB) Amy and Louis were. Reform as a whole class to share and discuss what this shows: Amy and Louis were never far apart, even if they were doing different things in different places, they were in the same yard, or the same room or next door. Point out the importance of this re being able to call out to each other with their special word. In the same pairs as above, have pairs record in relevant tables showing where (PDF, 135KB), details in the complication or resolution stage. As whole class share and discuss findings and importance for the story. Provide colour-coded cards (PDF, 112KB) for students to build sentences. The ‘where’ cards could also be used to complete a close activity. In groups of four, have one pair act/pose for a photo to show Amy and Louis in the orientation stage, with the other pair providing feedback and taking a photo, using I-pad or other device. Pairs then swap roles for complication stage. Deconstruct the plot of Amy and Louis (PDF, 104KB), as a class through using teacher modelling and guided questioning. brainstorm things the characters could do and then decide on three. Record brainstorms under headings and make accessible for students to draw on when constructing their plans. Jointly construct class story. Note: If the recording of the plot of Amy and Louis is read from top to bottom, it reads as a story. Where several options were provided, it is recommended you choose just one, for example, one summarising statement about what their life was usually like. what the characters are doing. page divided in two halves, showing how the friends now communicate: one side showing one friend ‘calling/sending a message’ and the other ‘hearing/receiving the message’. These could be hand drawings, drawn/created using digital tools or staged photographs. Model placing/pasting the written text onto/next to the visual, either on paper or in digital form. In addition, students could work in pairs or small groups and, writing in role as either Amy or Louis, jointly construct text to accompany the three visuals. These could then be compared and displayed. Using techniques modelled in class joint construction, have students innovate on Amy and Louis to plan, write and illustrate a story about them (the students) and their special friend (real or imaginary). Information about Libby Gleeson the author, her books and her awards. Information about Freya Blackwood and the other books she has illustrated. (This text also uses But one day, to signal beginning of complication and So to signal action which begins working toward a resolution. It could be read to students asking them to listen out for clues to show that a new part of the story is beginning).